10:00 AM Divine Liturgy (9:30 in summer). It all started in 1906ÃÂA small group of Orthodox people in Lopez saw the need for a parish of their own. A brotherhood, the Society of St Nicholas, was formed under the direction of Dimitri Evanoyko. This society decided to have a permanent house of worship. Mr Evanoyko went to Wilkes-Barre to consult with the VRev (now Saint) Alexis Toth, rector of Holy Resurrection Russian Orthodox Church. In 1906, with the help of Fr Toth, the Rev. Vladechefsky arrived in Lopez from Russia. 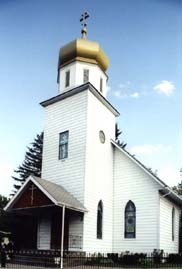 The first Divine Liturgy served in Lopez was in the house of Theodore Shymansky. In 1907, with the support of Fr Toth, the small group purchased a structure in Lopez for $700. This structure was built in 1899 by Methodist Protestants. It was a wooden building with a slate roof, 50 feet wide, 90 feet long and 18 feet high. There was even a pot belly stove in the middle to keep the parishioners warm in winter. A complete renovation took place under the direction of the choir master and local church leader, Dimitri Evanoyko. St Vladimir, equal to the Apostles was chosen as the Patron Saint of this new parish. The parish has always been small. The membership has never exceeded 75 families. In 1908 the parishioners bought an old home to be used as a rectory for $600 and renovated it the next year for the new parish priest, Rev. Basil Vekov. In 1911 the sanctuary was destroyed by fire and the iconostas and icons had to be replaced. In 1940 a hall was built behind the church and was used by the local school district as an elementary school, in addition to church school and many social events. In August of 1955, fire destroyed the interior of the church and many beautiful icons. In 1956, plans were formulated for financial assistance from the Russian Orthodox Council of New York to completely restore the icons and to purchase a new iconostas. The parish observed its Golden Anniversary in 1957 and in 1961 a new altar table was consecrated by Archbishop Dimitri of Wilkes-Barre. Under the direction of Fr Yaroslav Sudick (who served the parish from 1959 to 1967) and his Matushka, the congregation grew and prospered. Two native sons, Paul Borick and Andrew Matychak, went on to St Tikhon’s Orthodox Theological Seminary to become priests. A daughter of the parish, Kathy Matychak, went on to the monastic life, and is now Mother Christophora, Abbess of Holy Transfiguration Monastery in Ellwood City, PA. In 1986, upon his ordination to the Holy Priesthood, Hieromonk Michael (Thier) was assigned as Rector of the parish, a position he holds to the present day. On September 20, 1987, the parish celebrated its 80th Anniversary with a visit of Bishop Herman (now Metropolitan). Concelebrating with His Grace were Frs Yaroslav Sudick, Paul Borick, Michael Evans, and the host pastor, Fr Michael (Thier). Also in attendance were Mother Christophora and the nuns of Holy Transfiguration Monastery. A guest choir of some 20 voices under the direction of Matushka Valerie Sudick sang the responses. Many clergy and some 250 people helped celebrate the occasion by attending a banquet held at St Vladimir’s Hall. Because of the large crowds, two tents were erected to hold the overflow of people for the banquet. In the early 1990s, under the direction of Fr Michael, the parish undertook a major renovation of the rectory. This was blessed in 1994 by Archbishop Herman, who celebrated a Hierarchal Divine Liturgy on the occasion. St Tikhon’s Seminary Choir sang the responses for the Liturgy, and a dinner was held in the parish hall.